You’ve probably figured it out by now. Jon Acuff is one of my most favorite authors of all time. Several years ago, I reviewed for you a book he wrote titled Do-Over. Last month I gave you a lick of a sugar stick for his most recent offering, Finish. 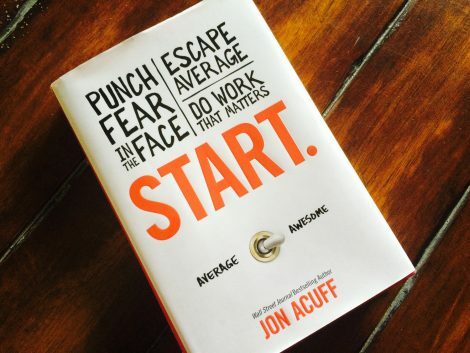 Since we just began a new year and 2019 is brand spanking new, I thought it’s only appropriate to dive into the shallow end of one of Acuff’s earlier works titled, Start: Punch Fear in the Face, Escape Average, Do Work That Matters. Perhaps it’s human nature to make resolutions at the beginning of a new year and kick it off with lofty goals. One of the most common ones is to exercise more, eat healthier and lose weight. There’s a reason why the gyms are not that busy in December but jam-packed in January. I certainly don’t begrudge anyone for trying to start something that will improve their quality of life, make them a better person or bring increased profit to their business. It’s better to attempt by starting something than being idle and watching the world move right by you. I don’t know what kind of year 2018 was for you in your dry cleaning or laundry operation. You alone have the insight and tools to take a personal self-inventory and honestly assess your business. Were your gears stuck in average? Did you soar to the heights of awesomeness? In Start, Acuff reveals the necessary steps to get unstuck and back onto the road of being awesome. • Our 20s are a period of learning. This is the decade of trying a million different things, exploring a host of interests, and eventually finding out what motivates us. • Our 30s are a period of editing. This is the decade of sorting out our interests and where we discover what we truly care about and who we are. • Our 40s are a period of mastering. This is the decade of narrowing our focus, honing varying skill sets and establishing ourselves as experts in our field. • Our 50s are a period of harvesting. This is the decade of reaping the benefits of good decision-making over the years and hopefully enjoying the highest income-earning period in a given career. • Our 60s are a period of guiding. This is the decade of mentoring, training and encouraging others to find their place on their path to success. • Anyone can play – The advancements in modern technology has given access to an unprecedented number of individuals who are building online empires and changing their lives in ways that would have been unheard of or impossible years ago. • Hope is boss – The days of “success first, significance later,” have ended. A new generation doesn’t want to change the world eventually; they want to change it now. The value system has not just gone through a paradigm shift; it has been flipped upside down. According to Acuff, there are only two paths in life: average and awesome. The average track is a piece of cake because all you have to do is nothing. The awesome path is more challenging and difficult because things like fear only bother you when you do work that matters. Just like the book says, “It’s time to punch fear in the face, escape average, and do work that matters.” Start gives readers actionable, honest, and practical insights to be more awesome, more often. What we do in the garment care industry not only matters, it’s also meaningful. As we kick off a new day, a new month and a new year, let’s be mindful of our importance and relevance as an industry to the quality of life in the communities we serve. 2019 is here, and it’s time to start.